Entry by Sabi on Tue Sep 23 06:13:19 2014. Lol, Sasha is like "Nooo, why did you kill that potato?!" OMG...mikasa crushed the potato !!!! 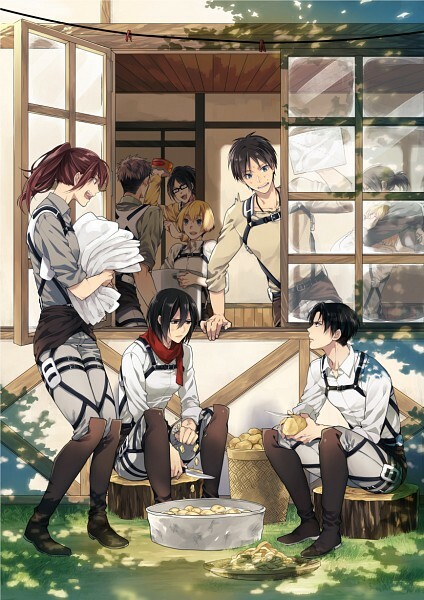 rivaille was the only one that noticed eren. I love how much Mikasa and Rivaille hate each other....or how much Mikasa hates him. Besides killing Titans, they eat potatoes. I am so sorry. I thought the shiny part of Armin's hair was a potato. Levi's like "That is NOT the proper cleaning technique"